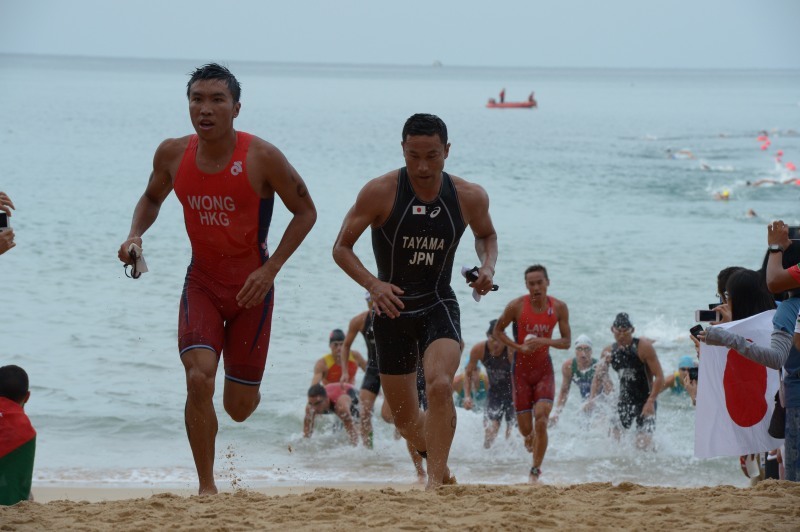 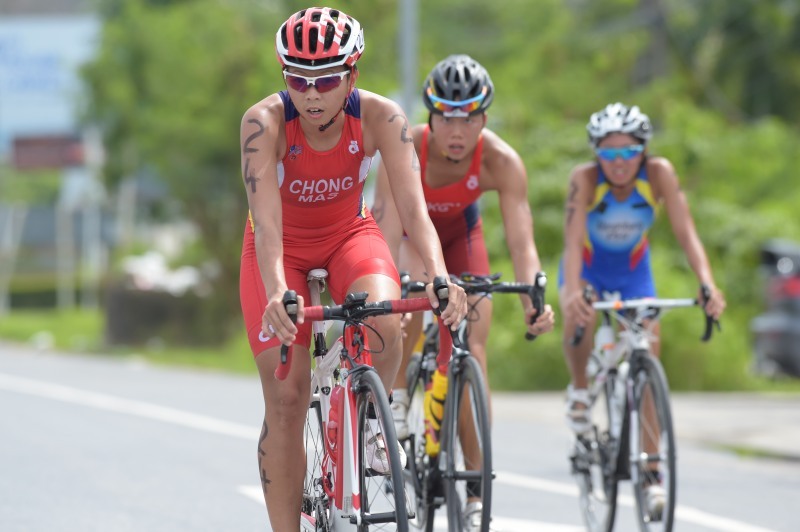 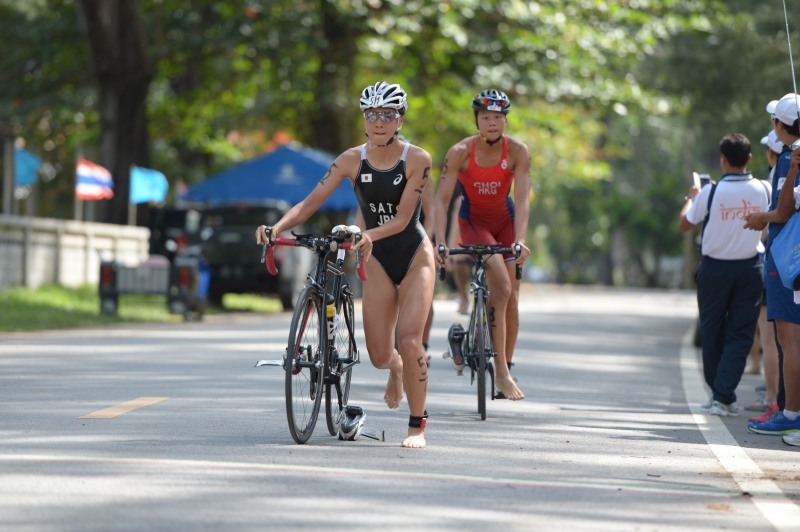 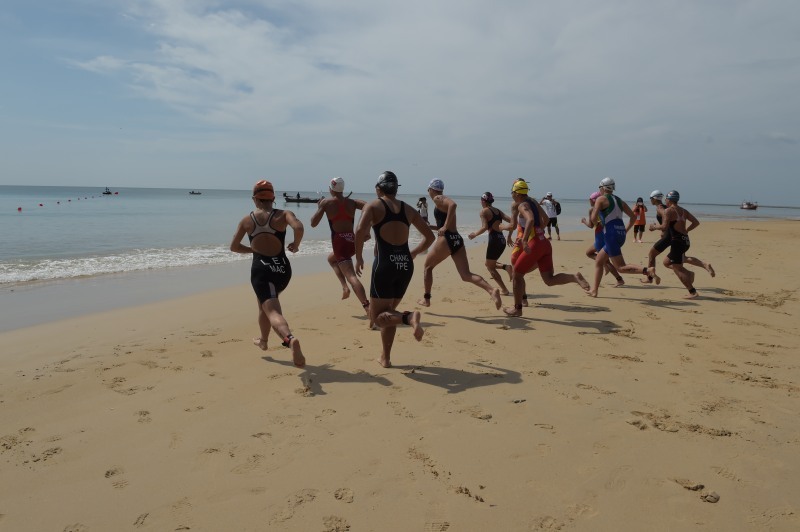 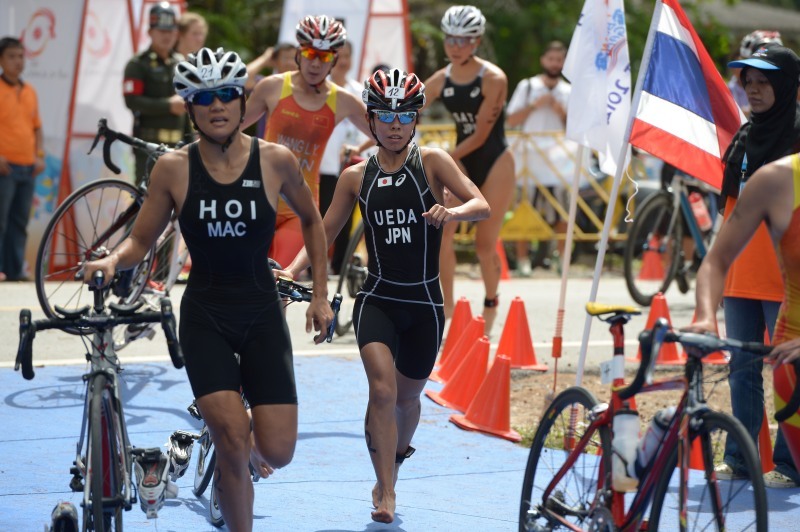 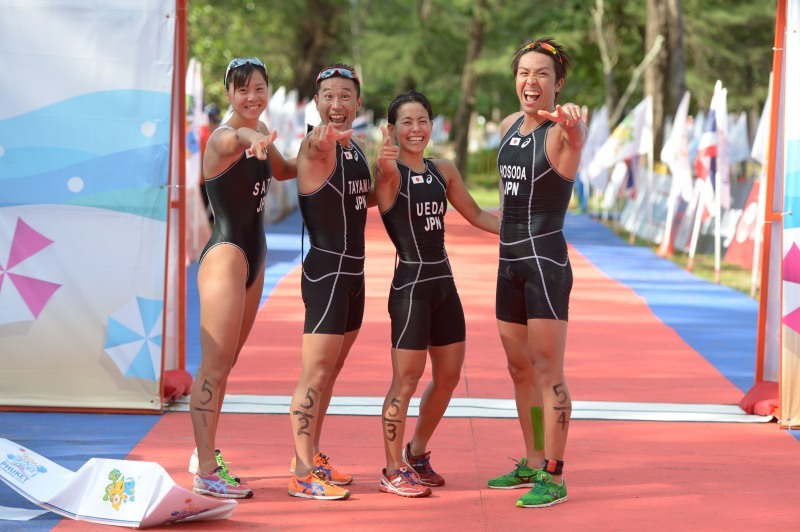 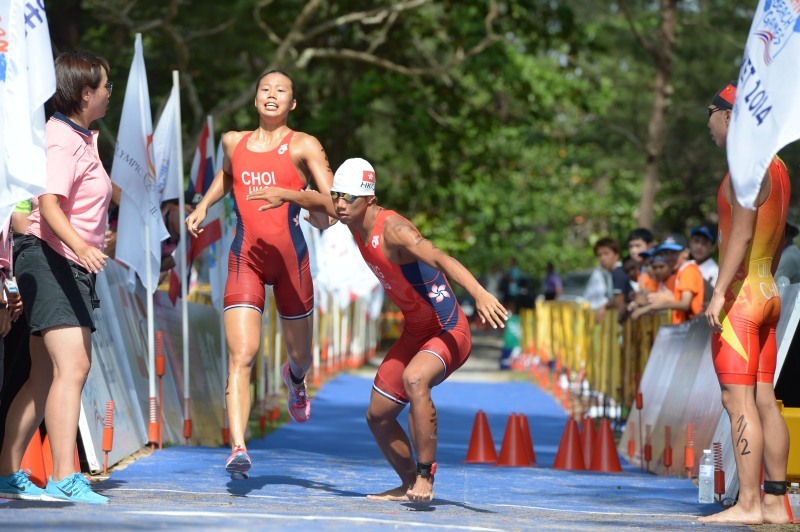 Japan capped off a successful International Games campaign this weekend with a win in the Mixed Relay at the 2014 Phuket Asian Beach Games and a 1-2 finish in the women’s triathlon headed by Ai Ueda. 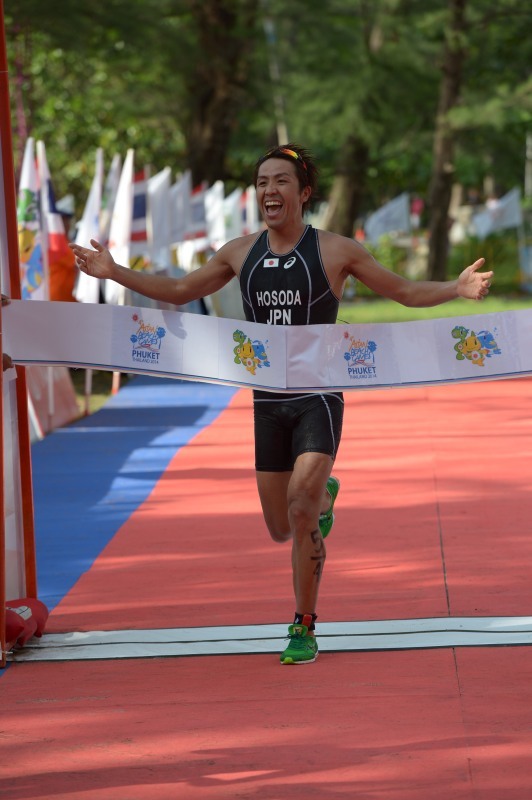 In the men’s race, Korea also competed to a gold-silver finish with 2012 London Olympian Min Ho Heo garnering the win. 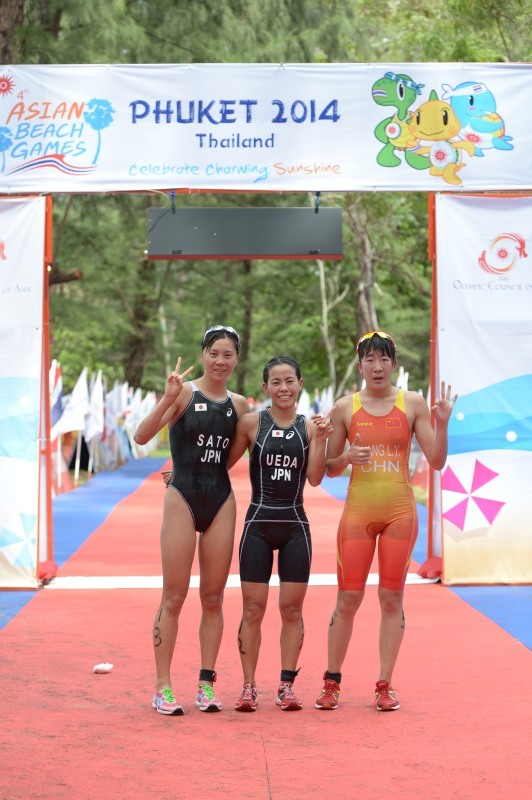 In a finish reminiscent of this year’s Incheon Asian Games, Ai Ueda (JPN) came out on top at the Asian Beach Games just months after winning in Korea. 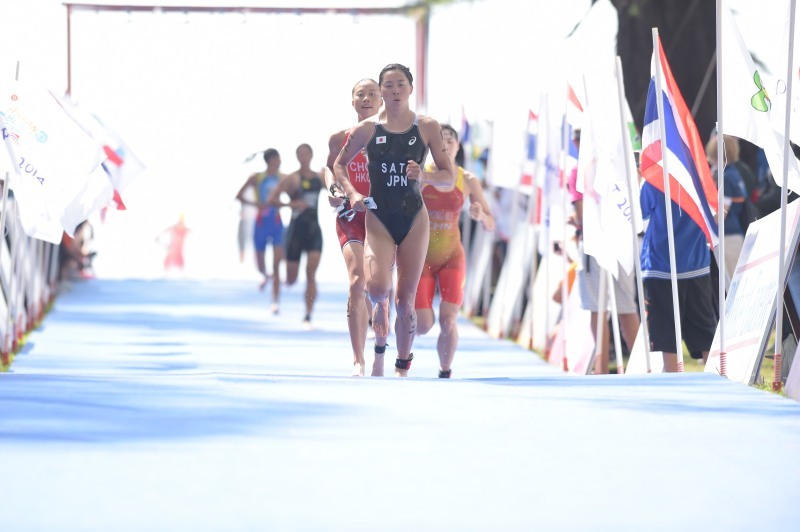 Also keeping with the pattern, Lianyuan Wang (CHN) crossed over in third just as she did in Incheon. 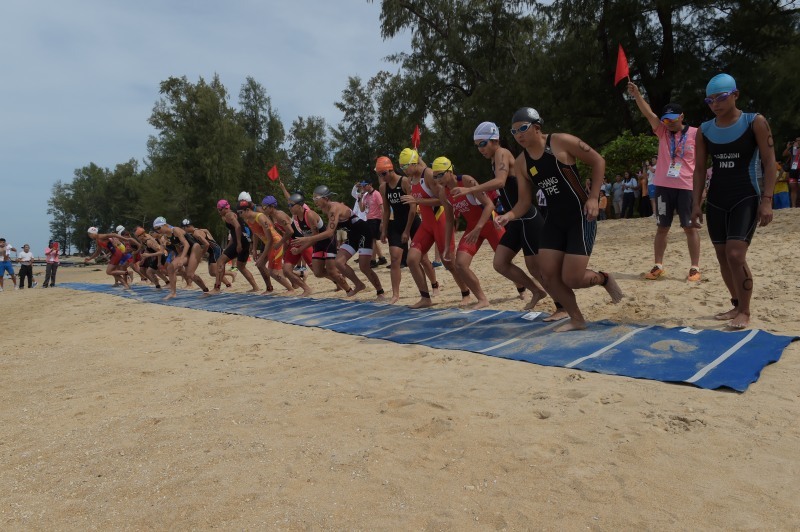 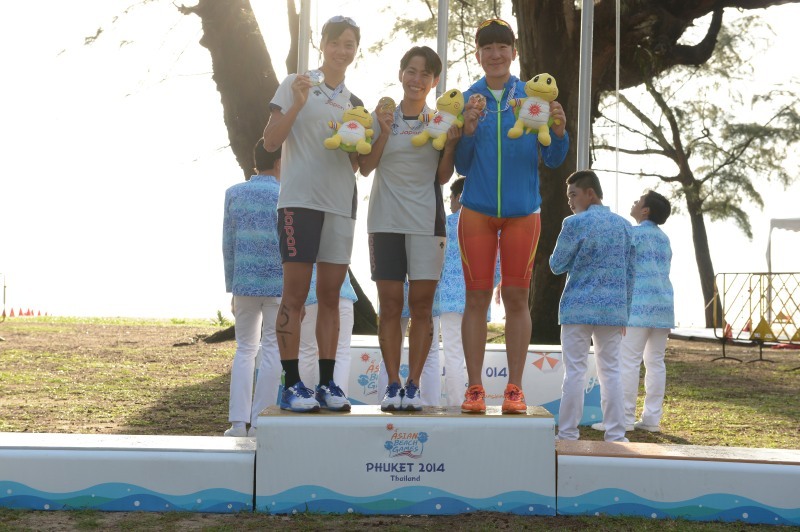 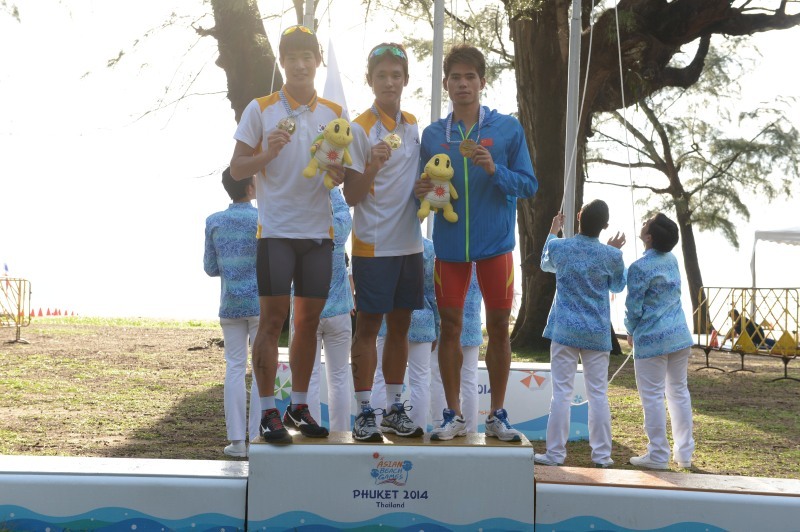 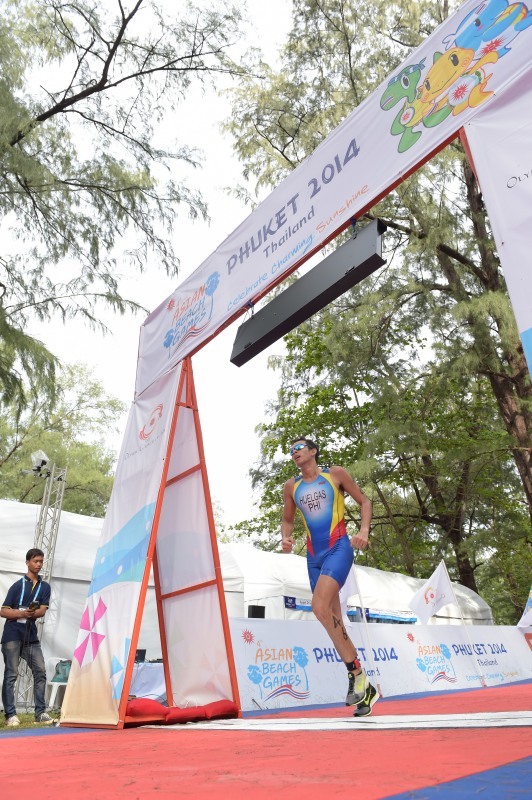 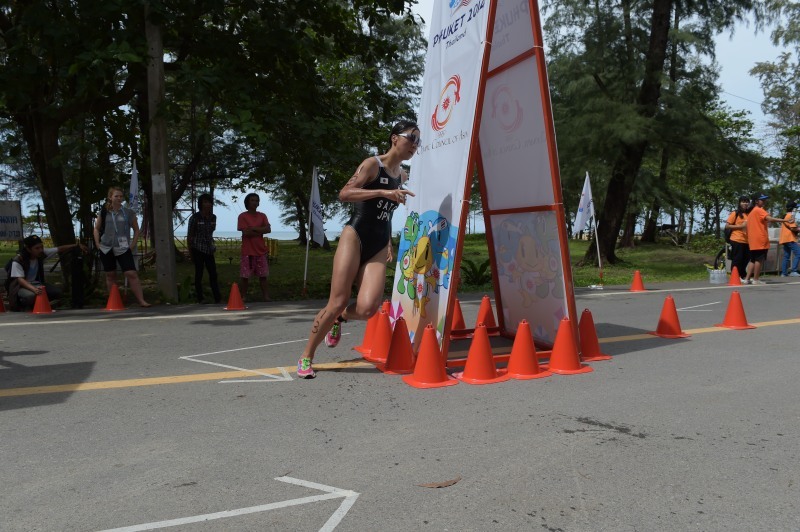 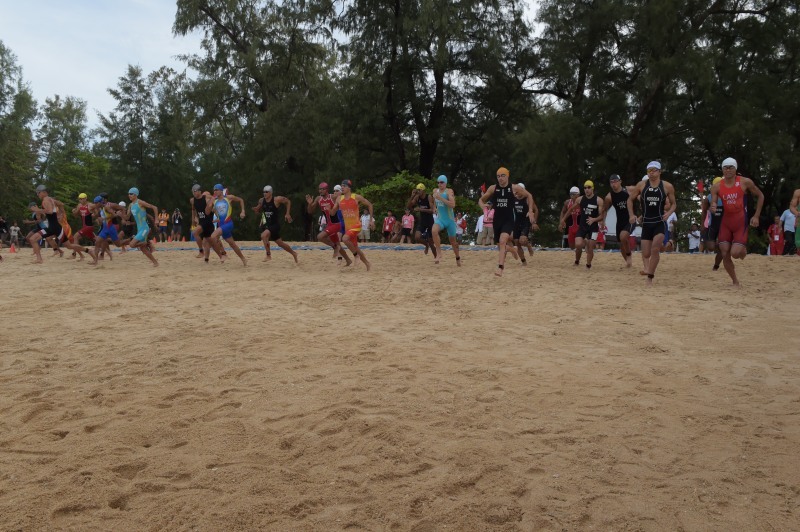 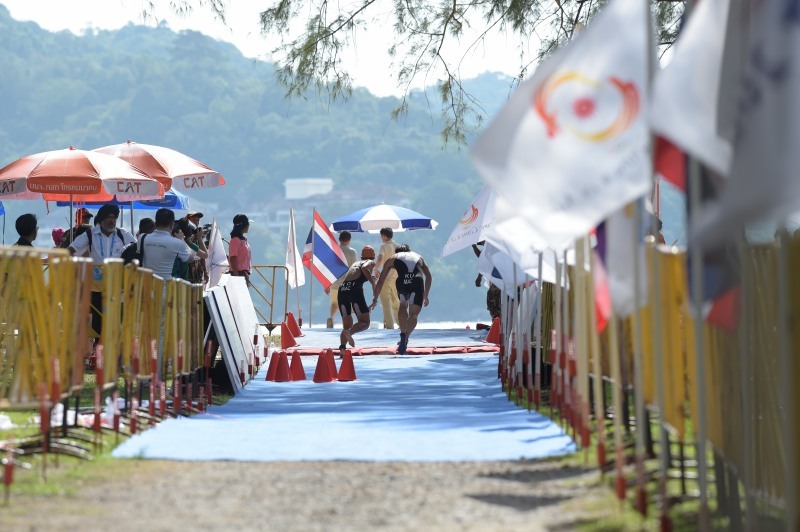 While Asian Games silver medallist Juri Ide (JPN) sat out the Asian Beach Games, compatriot Yuka Sato took her place as the runner up in Phuket. 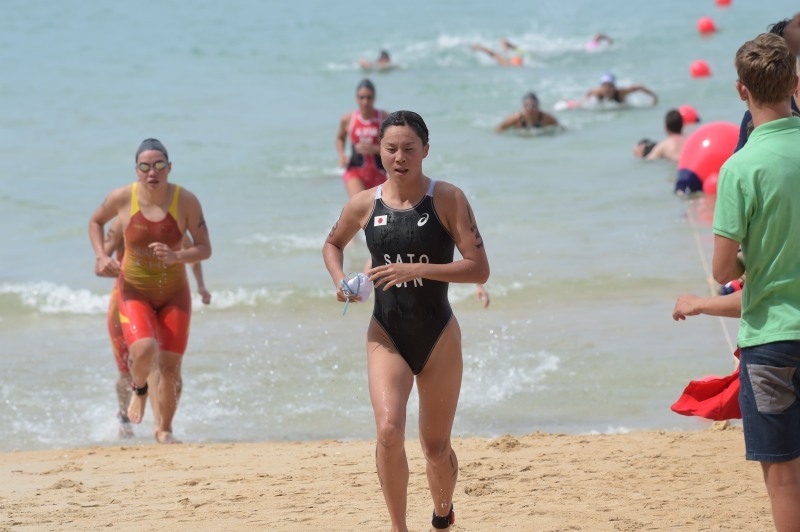 It was Sato who led out of the water while Wang held back slightly to exit just seconds later with her teammate Yuting Huang (CHN). 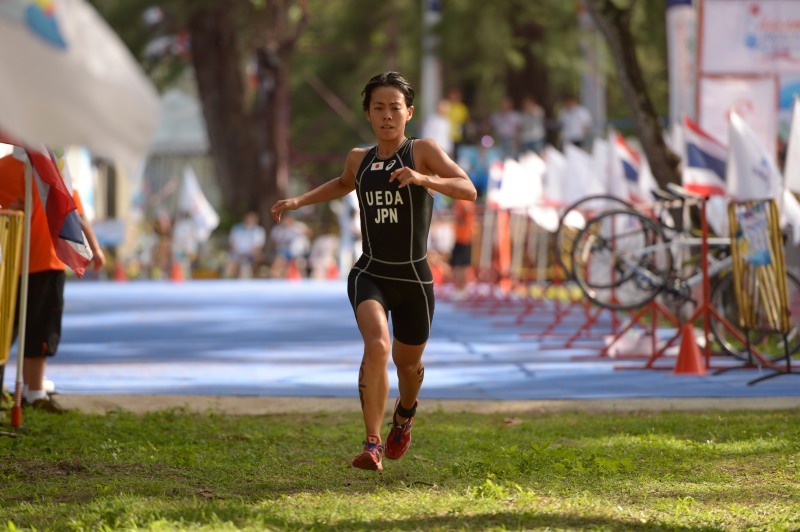 While Ueda was down 20 seconds at T1, she quickly powered to the front of the bike with the fastest split of the race. 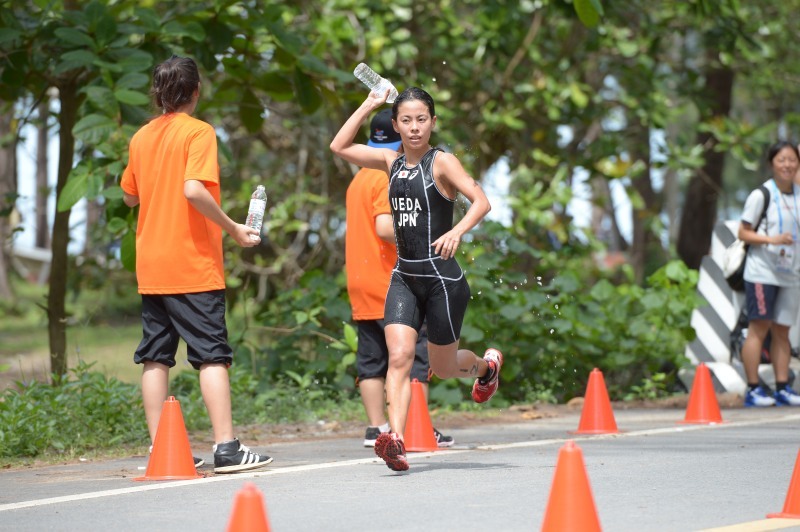 From there, the race was hers to lose as she also clocked the fastest 10km split to win the event in 1:00:30. 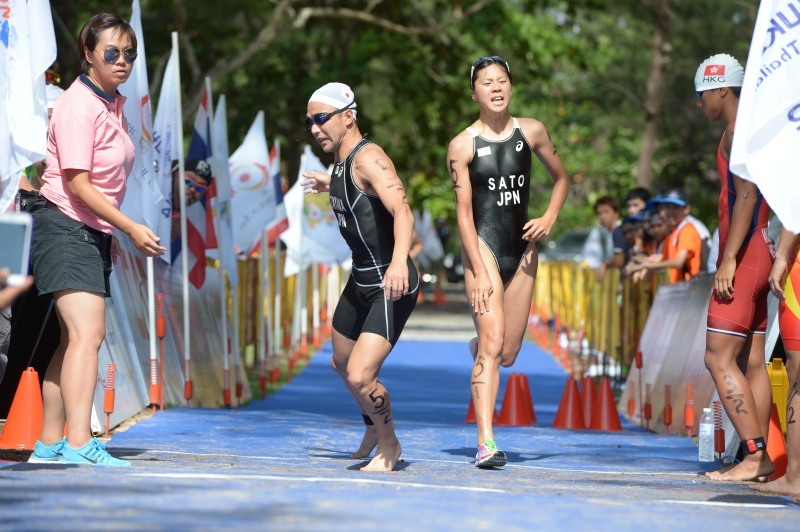 Sato just held off Wang on the run to steal silver nearly half a minute later, leaving bronze to Wang in 1:01:06. 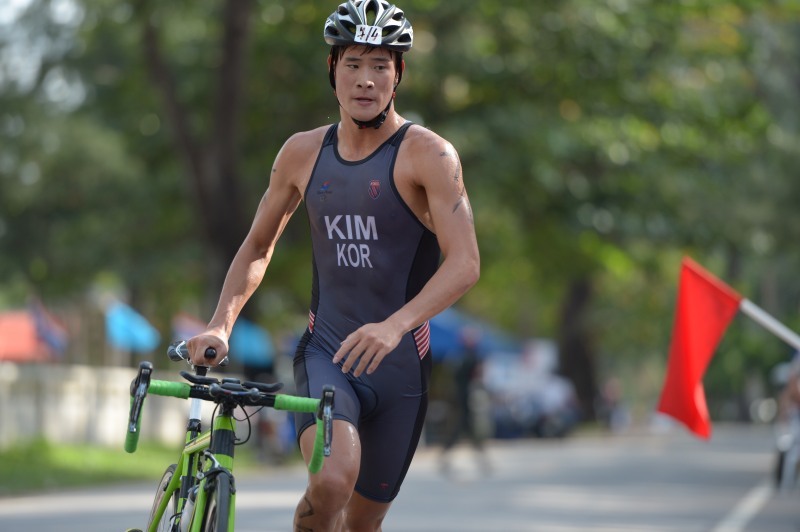 In the men’s race, Korean Olympian Min Ho Heo scored gold, leading nearly line to line with a top swim and bike before finishing it off with the fastest run split of the day. 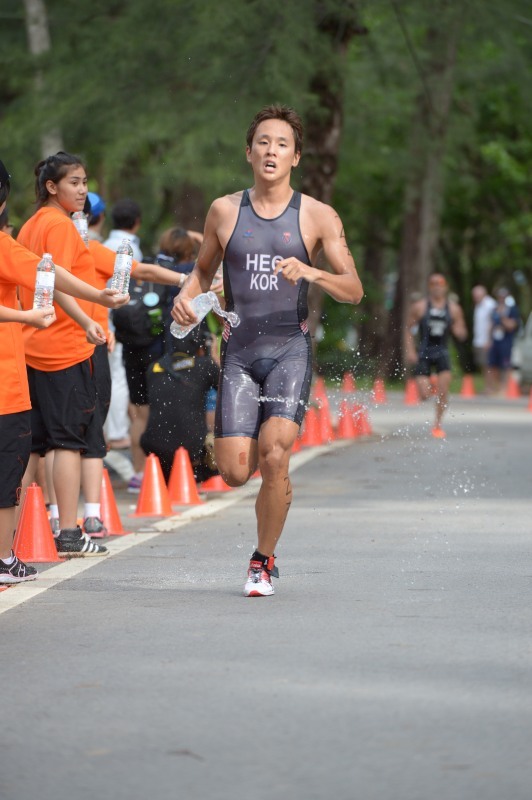 Making it a Korean 1-2 finish, Ji Hwan Kim held off Faquan Bai (CHN) for second leaving bronze for the Chinese athlete. 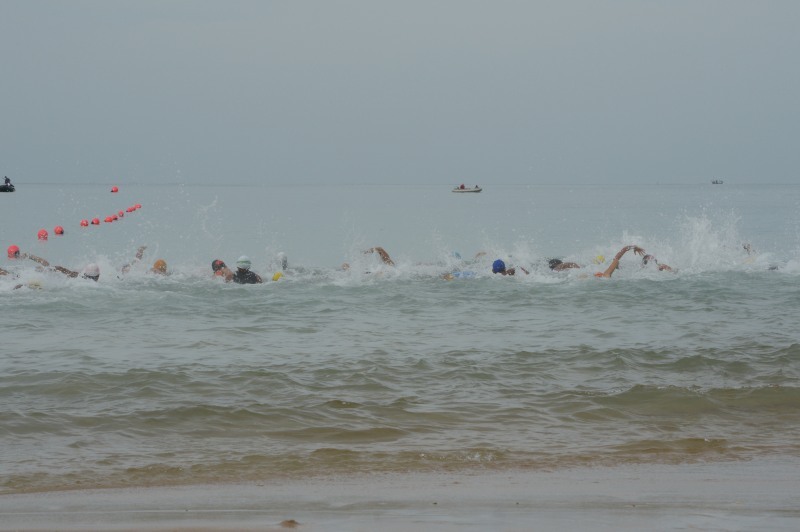 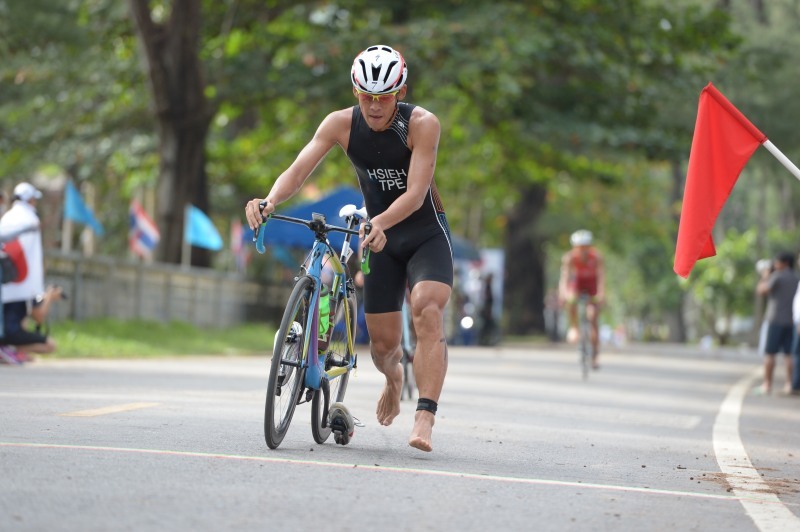 With just one lap in the sprint-distance event, 16 men emerged from the water within 19 seconds of one another creating a large bike pack that proved to be impossible to catch. 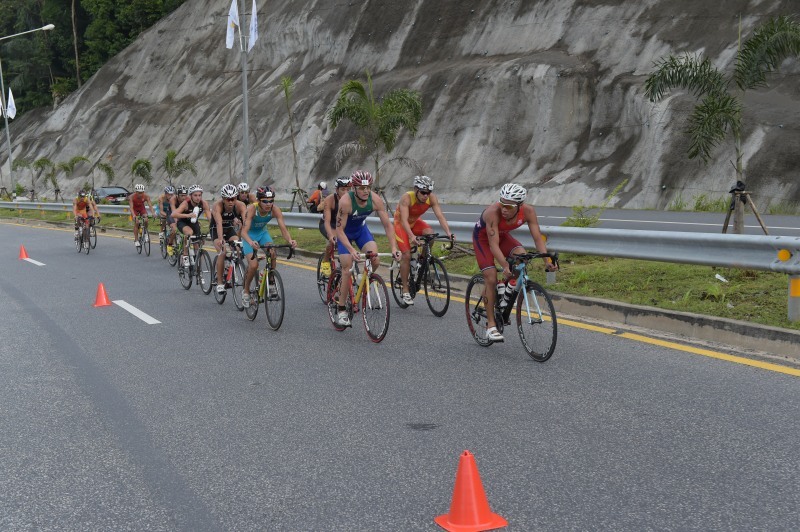 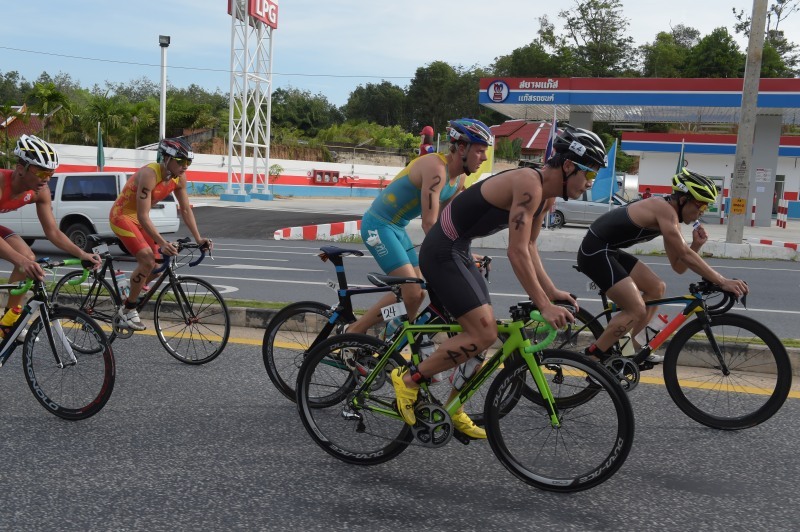 While three men were dropped from the lead group, a baker’s dozen of men hit T2 together. 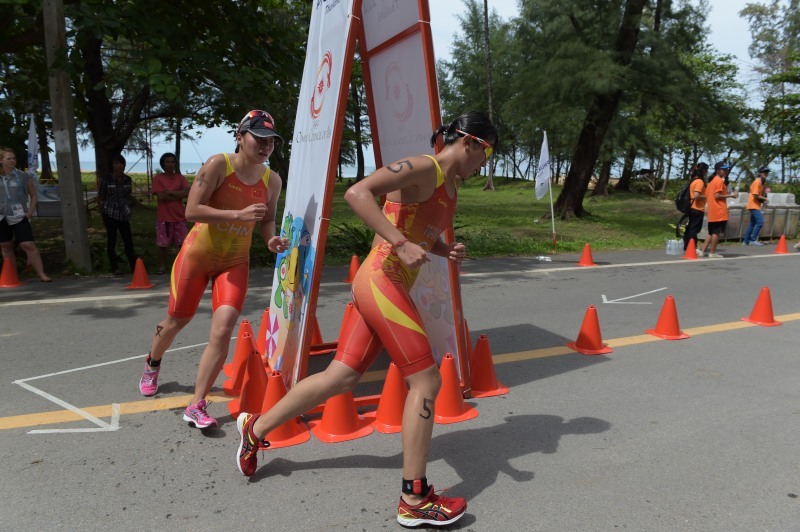 But it was Heo who headed off with intent, spurring Kim and Bai to follow. 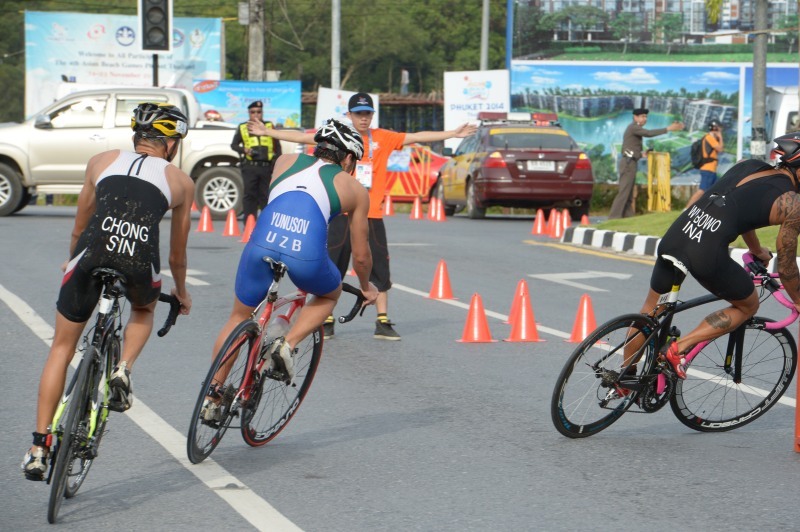 While Hirokatsu Tayama (JPN) and Valentin Meshcheryakov (KAZ) tried to keep pace, the top three were too fast. 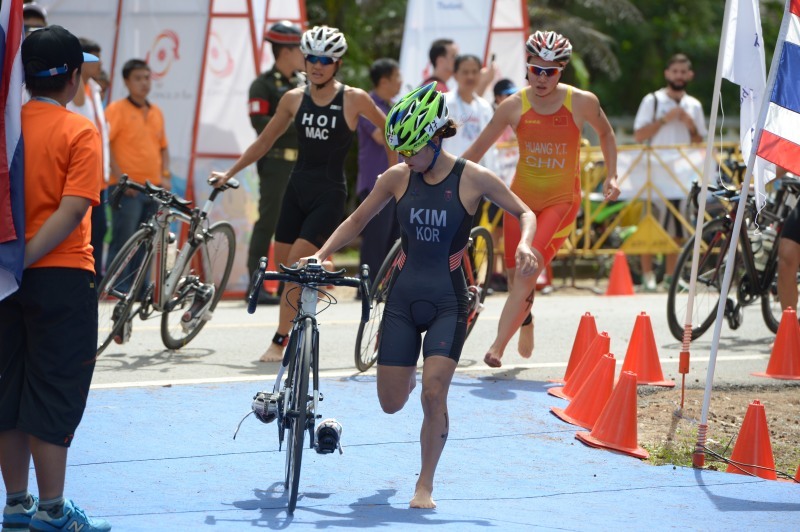 Heo was crowned Asian Beach Games champion in 54:10 while his teammate Kim followed 10 seconds later with Bai taking bronze in 54:28. 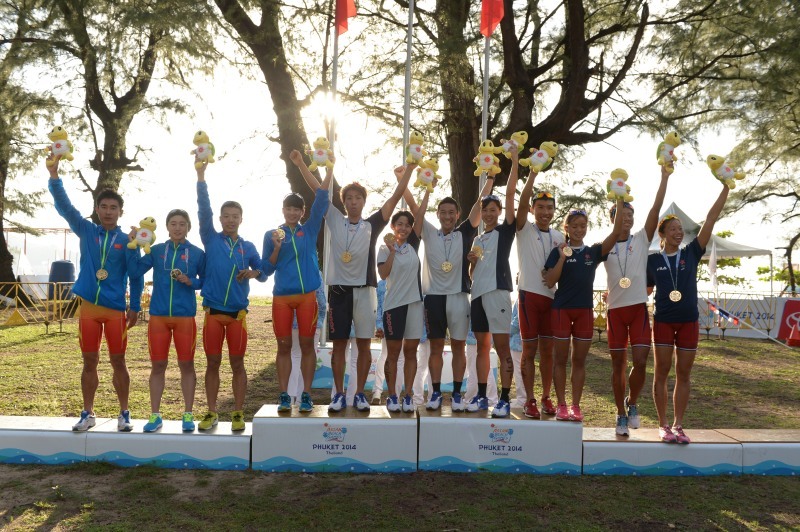 Japan, which also won the race at the Asian Games this year, took the lead first and never gave it up to win the race by more than two minutes. 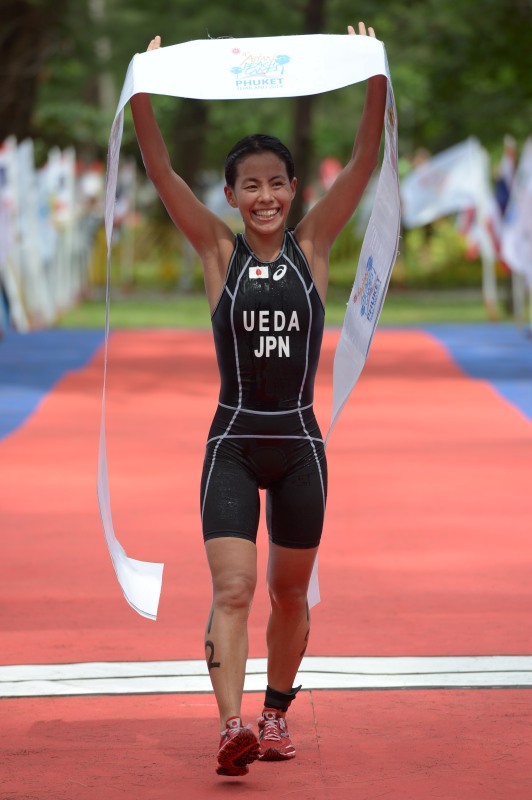 Ai Ueda assisted her team on the winning, making her a double gold medallist in just one day of competition. 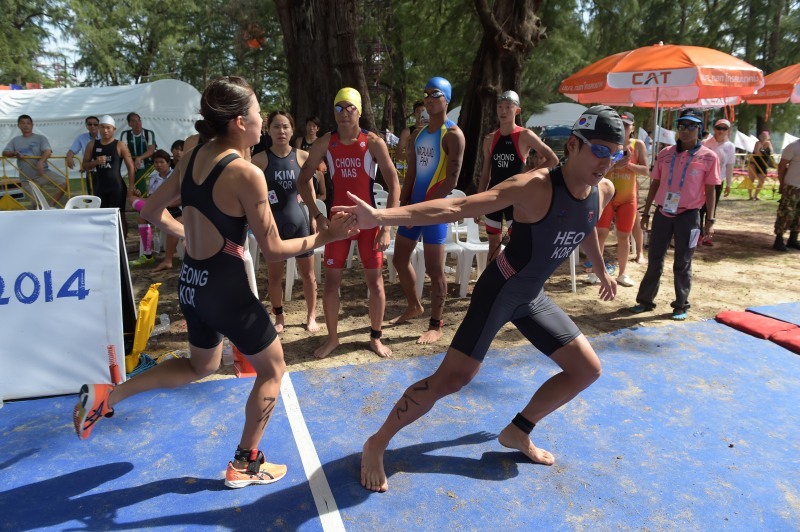 Behind Japan, three teams finished within a minute of each other underscoring the event’s increasing competitiveness.While Hong Kong was positioned for silver after its first two athletes, China used a reverse method, saving it’s fastest two athletes for the back half. 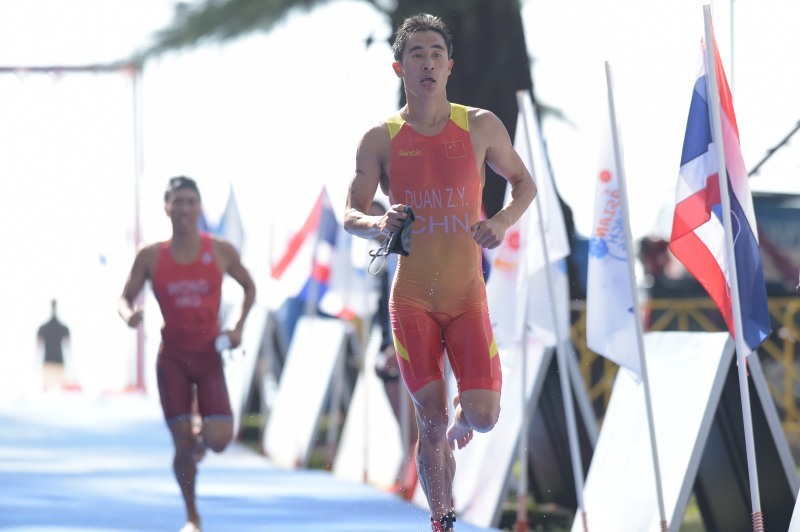 The strategy played to their favour as China overtook Hong Kong with its final two athletes for silver leaving Hong Kong to round out the podium.